The date palm, native to the Middle East, was mentioned in the bible as the "tree of life," and the word "date" comes from the Greek "daktulos," which means "finger." Dates grow in large bunches which can weigh as much as 40 pounds, and large trees will yield more than 1,000 dates each year. In many countries dates are added to salads, couscous dishes, and curries, but in North America, they're more commonly found in baked desserts and confections. Because dates are very high in sugar, they can easily be converted into sugar. To make date sugar, arrange sliced dates on a baking sheet and bake at 450 F for 10 to 15 minutes, or until they become very dry and hard as rocks. Grind or process in a food processor to make sugar. Store dried dates in a cool, dry place for 6 to 12 months. Tightly wrapped fresh dates will keep for up to 2 weeks in the refrigerator. These delicious date recipes include breads, muffins, cookies, savory dishes, appetizers, and sweet bars. 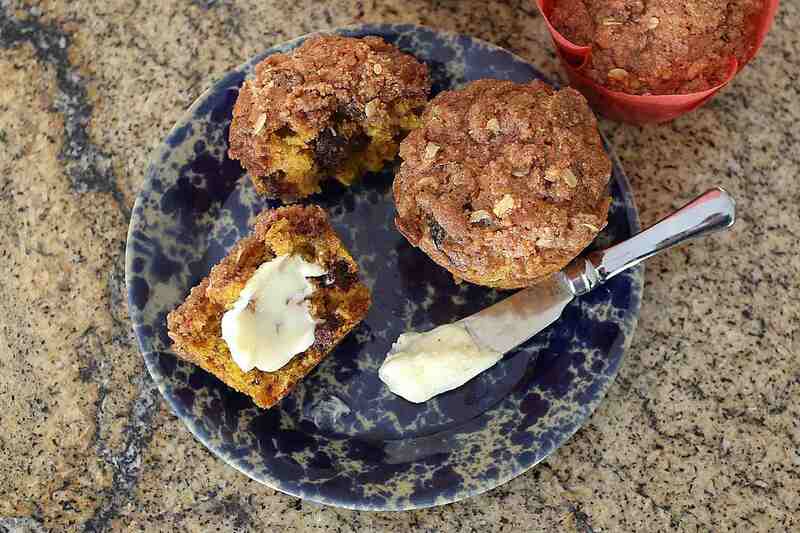 These moist and delicious pumpkin muffins feature chopped dried dates. An oat and streusel topping is the perfect finishing touch for additional texture and flavor. These traditional triangular pastry cookies often include chocolate, peanut butter, marzipan, and many kinds of fruit fillings. This version contains a sweet filling of dates and honey. These classic date squares are incredibly delicious. The crust and topping are a combination of oats, brown sugar, and butter. These date squares are an excellent choice for a bake sale. Or take them along to a cookout or potluck. This Moroccan dish pairs dried dates and meat with a variety of spices. Almonds and sesame seeds garnish servings, providing texture to the finished dish. You don't need a clay tagine to make this delicious dish; use your Instant Pot or conventional pressure cooker. The reason these appetizers are called "devils" is that they are dark in color. These fabulous little bites are always a hit! Asiago cheese complements the dates nicely, while the bacon wrapping adds the salty flavor to the sweet and savory filling. Chopped dates, optional nuts or seeds, and vanilla team up to flavor this quick bread. Bake two loaves—one to enjoy today and another one to freeze for later. A dollop of thickened cooked dates and a dab of cookie batter tops these heavenly soft brown sugar cookies. You'll make these fabulous old-fashioned cookies again and again. Orange juice adds flavor to this yummy date bread. Add some chopped pecans or walnuts if you'd like. Serve the bread with soft whipped orange butter or a cream cheese spread. These old-fashioned no-bake skillet cookies are always a hit. The cookies come together on the stovetop with dates, crispy rice cereal, and pecans. The mixture is shaped into balls and rolled in coconut. These chewy, crunchy cookie treats are as easy as 1-2-3! Dried dates and chopped pecans add flavor and texture to this moist, delicious sweet potato bread pudding. Serve the bread pudding with the brown sugar sauce or bourbon sauce. If you're looking for the perfect sweet treat for a party, your search is over! Homemade sweet almond paste makes up the filling for these dates. Add some color to the almond paste or garnish each filled date with a walnut half. Plump Medjool dates are an excellent choice for this dish. The filling of dates and nuts gives these little turnover cookies excellent flavor and texture. The cookies make a wonderful snack for the weekend or bake them for your holiday guests. These delicious muffins are packed with chopped dates and walnuts, and preparation is a breeze. Use orange extract or vanilla for flavoring. These truffles are a charoset treat traditionally made for Passover. This combination includes a paste of dates, apples, walnuts, and pistachios. Cinnamon sugar is the perfect finish! This moist date bread freezes well, so you might want to make two loaves. Try spreading plain or lightly sweetened cream cheese between two thin slices and freeze the "sandwiches" to enjoy later. This rich coconut rice pudding contains coconut milk, toasted almonds, and dates, along with a variety of dried fruits and spices. It is a symphony of flavors. 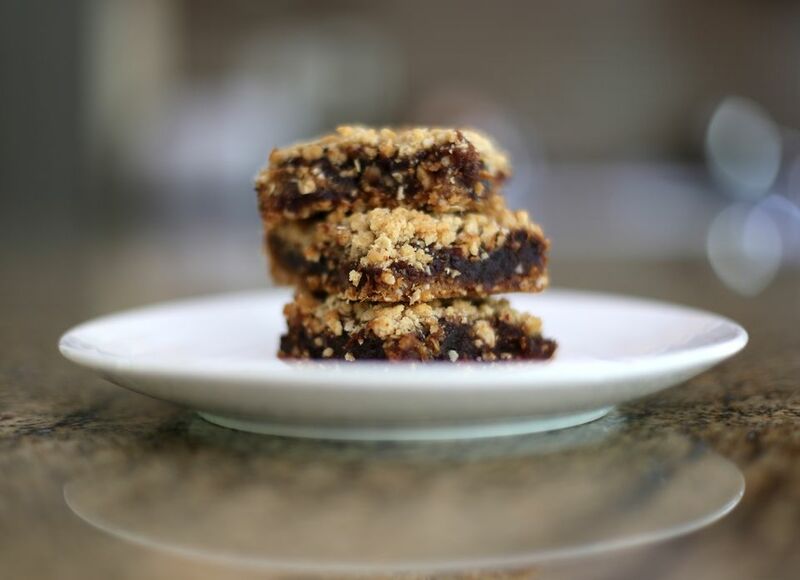 These amazing date bars are not only delicious—they are gluten-free! The crust for these delightful treats is made with oats, flaxseed meal, coconut sugar, and tahini. Fiber and nutrient-rich dates are "nature's candy." A Nutella-like mixture of hazelnuts and cocoa make up the stuffing for these sweet confections.